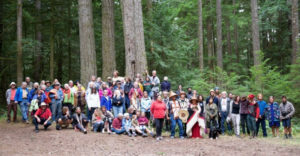 October 8, 2016 – Roberts Creek BC: At yesterday’s BC Supreme Court hearing (in Vancouver, BC), the judge granted Peninsula Logging a 2nd injunction that essentially allows for the completion of logging in the ‘Twist and Shout Forest’ (cutblock A87125) within the proposed Mt Elphinstone park expansion area. While we are disappointed, we will abide by the ruling. Thus, ELF will not be participating in further civil disobedience that prevents the timber falling or log hauling. We don’t have control over other people’s actions who may take a different view, however we are not encouraging others to violate the injunction. See Campaign Page for further information here.